How will Greece affect your money? Stock markets are making some nausea-inducing moves Monday as investors react to major developments out of Greece and China. 1. Investors seeing red: U.S. stock futures are deep in negative territory, with investors taking their cue from Europe and Asia, where nearly all major stock markets are falling. European stock markets are down by roughly 1% to 2% as traders react to the results of Sunday's Greek referendum. The country voted by a wide margin to reject Europe's latest bailout offer. This raises the risk that the country could now suffer a worse economic disaster and lose its place in the euro. Yields on Greek 10-year government bonds soared to nearly 17% as investors saw an increased risk that the country will have to dump the euro. Yields on government bonds in Spain, Portugal and Italy are also rising, though the moves were modest. Bond yields in perceived safe havens like Germany and the U.S. are edging lower. Meanwhile, Chinese stocks remained volatile, despite a series of dramatic steps by officials over the weekend that were designed to support markets. After opening with a gain of roughly 7%, the benchmark Shanghai Composite lost steam. It closed with a gain of 2.4% Monday. The smaller Shenzhen Composite, which also started the day in positive territory, reversed course and ended 2.7% lower. The CNNMoney Fear & Greed Index is indicating there's extreme fear in the markets. 2. Keeping up with currencies: The U.S. dollar and British pound are broadly stronger Monday morning while the euro is weaker. 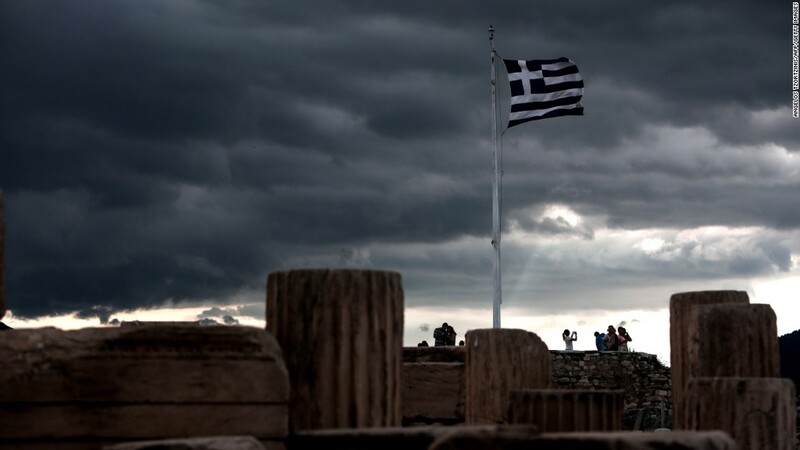 Traders are reacting to continued uncertainty about Greece's future. 3. Stock market mover -- Rolls-Royce Holdings: Investors are selling shares in Rolls-Royce Holdings (RYCEY), which is one of the world's biggest manufacturers of aerospace engines. The stock is dropping by about 9% in London after the company warned about weaker-than-expected business trends in the first half of this year. The company is also halting its share buyback program. 4. Waiting for an Iran deal: Investors are waiting for further developments out of Iran. Negotiators from Iran, the United States, China, Germany, France, Britain and Russia are trying to reach a deal to lift sanctions against Iran in exchange for assurances that the country will maintain a peaceful nuclear program. A June 30 deadline for an agreement has come and gone, so now U.S. negotiators are hoping for a deal later this week. 5. Oil on the skids: U.S. crude futures were trading more than 4% down at $54.50 a barrel. A deal with Iran could unleash new supplies to world markets. Oil was also being hit by the general "risk-off" mood following the Greek vote.